January is the time to make resolutions that we’ll hopefully stick to for the rest of the year. With all the emphasis on diet and exercise at New Year, these don’t often last – think of all the new sign-ups to the gym in January and the sales of healthy cookbooks go through the roof! According to Business Insider UK, 80% of New Year’s resolutions fail by February (I know mine usually do!). So, how should we improve ourselves in January so that we keep it up throughout 2018? Check out these New Year resolutions for boosting mind, mood and body that don’t revolve around sensible eating and joining a gym (yay!). This year, make more time for family get-togethers and days out. This might sound easy, but if you cast your mind back to 2017, you’re probably only able to pick out a handful of memorable moments that you’ve spent with your loved ones. I spend most Sundays with my parents and we’ll go shopping or out for a walk and then my mum will cook us all a big Sunday lunch – perfect! Committing to this doesn’t just mean getting home slightly earlier from work to spend time with your partner. Make 2018 the year for creating unforgettable moments. Climb Snowdon, go dolphin spotting or whale-watching, hike through a national park (my fave is the Lake District! ), kayak down your nearest river, or do a sponsored abseil. Big events give your family a collective goal to achieve, which means you get to train and prepare together, as well as make a long-lasting memory at the end. Why is family time important? Studies show that maintaining a good family life can fend off medical problems in later life. According to the Journal of Neurology, Neurosurgery & Psychiatry, single people have a higher risk of developing dementia, while New York University found that married people suffer less from cardiovascular disease than singletons. Although I don’t believe that a relationship is necessarily that important to happiness, it is important to be surrounded by people that you love. How about taking family trips? The Journals of Vacation Marketing found that people waiting to go on holiday felt happier with their lives and experienced less negative emotions. I can definitely second this – having a holiday booked gives you something to focus on and look forward to. So, stuff 2018 full of family holidays – try and go somewhere you’ve all never visited before to keep moods high in your home. We have a big family holiday to Portugal every year and I love it! 2018 is the time to step back and re-evaluate your job — whether this means switching careers or just making positive changes. If you feel you need a creative outlet for some of your ideas, maybe you could start a blog (if you don’t have one already!) — there are plenty of how-to guides to help you get started (feel free to ask, if you need any tips!). Want to climb the career ladder but feel you’ve hit the ceiling? Search for relevant courses and ask for external training from your HR department. Training will be up to you to get sorted, so don’t be complacent. Or is it company morale that’s getting you down? Corporate days out are growing massively in popularity, so suggest a team-building trip somewhere to lift everyone’s spirits. Sports venues are particularly good for getting people working together in a fun, relaxed environment, and doing something outside is always good. Take a lead role in organising social events for your team – it’s something that often gets forgotten about when everyone is so busy. Even something as simple as re-decorating your office or desk, arranging a night out with your team or organising Friday afternoon quizzes (I can personally recommend the Joe Friday pub quiz!) can work to lift the atmosphere and make work a little easier to endure. We spend pretty much a third of each day at work – so it has to be bearable! It wouldn’t be a New Year without a burning desire to lose weight and get fit. 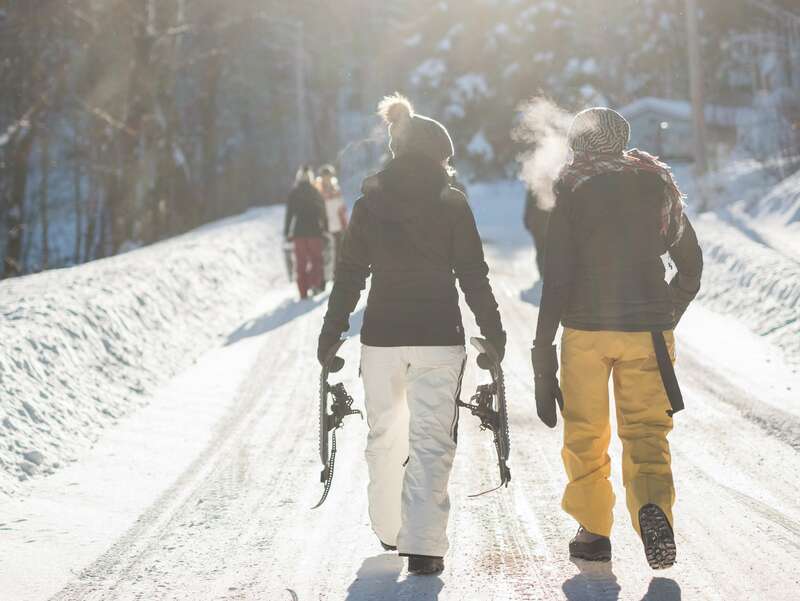 But instead of dragging yourself to the gym or pounding the pavement, why not get active with a more off-centre exercise, like skiing or snowboarding? This is something that I definitely want to try this year – not least because it will open up so many new holiday possibilities! An average adult can burn between 250 and 630 calories every hour while skiing or snowboarding, and the exercise tests your balance and works all your major muscle groups to help you tone up quickly. Plus, it doesn’t feel like exercise if you’re having fun! Adrenaline-pumping sports like this one also encourages your body to release endorphins — which are neurochemicals that create a feeling of happiness and lower stress — while a study, published in the American Journal of Psychiatry, showed that regular exercise reduced the chances of developing depression. Snow sports are fast, fun and intense — but the skills for them take time to master. However, there are indoor slopes, snowboarding lessons and skiing lessons available to help you challenge yourself and become a pro (or at least able to stand up on skis) in 2018. Rather than putting yourself on a gruelling, strict diet, make healthy eating more tolerable by putting a spin on it — like incorporating nutritious global dishes into your daily intake. Shake-up your diet and promise yourself that you’ll use at least three healthy ingredients from across the world every week. Harissa, a chili paste from northern Africa, is believed to have cancer-protective qualities and tastes great in soups, while lucuma (from Peru) makes a perfect snack and contains carotene that can reportedly reduce the effects of ageing. For breakfast, put some chia seeds in your porridge — this food comes from Mexico and offers a healthy dose of omega-3 fatty acids. Considering that one of the most recent examples of creating a world record was for the most people to play a tune on a single piano, you really can set a global achievement in almost any activity. Search online for exercises that have already been done and get practicing to mark 2018 as the year you became a record holder. What are you planning to do in 2018? Let me know in the comments!